Description: Parsley or garden parsley is a species of Petroselinum in the family Apiaceae, native to the central Mediterranean region (southern Italy, Algeria, and Tunisia), naturalized elsewhere in Europe, and widely cultivated as a herb, a spice, and a vegetable. 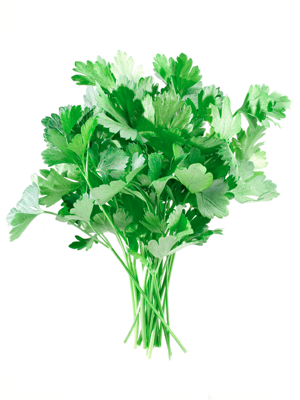 Culinary Uses: Parsley is widely used in Middle Eastern, European, and American cooking. Curly leaf parsley is often used as a garnish. In central and eastern Europe and in western Asia, many dishes are served with fresh green chopped parsley sprinkled on top. Root parsley is very common in central and eastern European cuisines, where it is used as a snack or a vegetable in many soups, stews, and casseroles.